You might think you’re doing everything right in terms of counting and tracking your calories, but when it comes to estimating fast food calories, you could be way out. You’re on a tightly calorie controlled diet – what’s known as a macronutrient-based eating plan, flexible dieting, or IIFYM – If It Fits Your Macros. These diets are great for allowing you flexibility in your food choices, as they don’t have set rules. Each day you need to hit a certain calorie intake, and get close to set amounts of protein, carbohydrate and fat, and within these boundaries, you can eat more or less what you like. When you’re cooking for yourself and have access to kitchen scales and can control exactly what goes into your meals, counting calories is incredibly easy: Weigh everything out, plug it into your calorie tracking app or website and away you go. You’d think that eating out wouldn’t be much more difficult. Take a quick look at the menu, order something that sounds like it’ll fit in nicely with the rest of your day’s food and take a scan of the plate when you get it to your table. Provided you chose relatively basic ingredients and can eyeball amounts, it should be fairly easy to guesstimate the calorie content and input this into your diary when you get home. 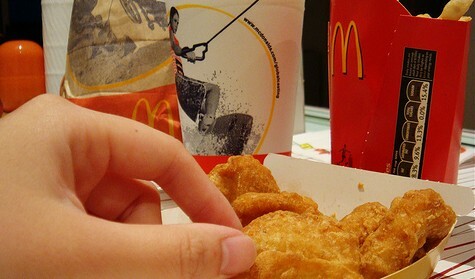 It turns out though that we actually underestimate the calories in fast food by 20%. Teens and school age children are the worst offenders – underestimating by as much as 34%, but adults don’t fare much better. You might think this isn’t a huge issue, but as with anything, the consequences can add up. Say you need to eat 1600 calories per day to lose one pound per week and eat what you believe to be 500 calories of fast food, three days per week. Each week, you’re actually eating three lots of 600 calories, adding 300 calories to your weekly intake. It takes a calorie deficit of 3,500 calories to lose a pound, so going off these figures, that equates to a pound less weight loss every 12 weeks – over four pounds in a year. And that’s only eating a 500 calorie fast food meal (most typical meals are in the 1,200-1,600 bracket) and indulging just three times per week. The calorie estimation research was carried out in New England throughout 2010 and 2011 and published in an edition of the “British Medical Journal.” One surprising aspect the researchers noted was that participants tended to underestimate calories even more at supposedly healthy fast food restaurants. People were much further out with their calorie guesses at Subway than they were at McDonalds. It would stand to reason that the average member of the public believes that salad items are almost calorie-free, while whole-grain breads are healthy, meaning they think Subway is a much lower calorie option. Compare a typical Subway meal of a turkey, salami and cheese footlong on wheat bread with salad and a dressing and you’re looking at at least 750 calories, and that’s without drinks, chips or cookies. A McDonalds Big Mac is only 550 calories, yet you’d believe McDonalds to be a far worse option than a “healthy” sub.